Tuffy says: Azuls Skippy Val is Breeding Stock. This is the last foal out of Skippy. She was going to stay here as an addition to our broodmare band. But we have so many babies this year Rick said to pick some and put them up for sale. So here is one of my babies that I had picked to keep. She is a really GREAT filly!! !BUT MY HUSBAND SOLD HER!! BUT AS OF 2014 WE HAVE HER BACK THANKS TO TOM AND CINDY PARKER WHO HAVE RETIRED FROM THE HORSE BUSINESS! I JUMPED AT THE CHANCE TO GET THIS AMAZING MARE BACK INTO OUR PROGRAM! 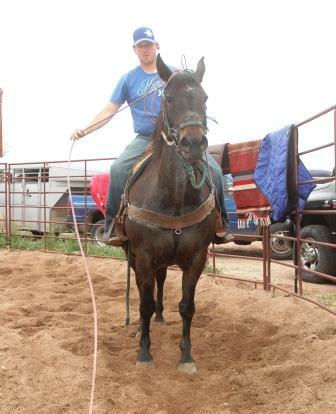 BROKE TO RIDE AND STARTED ROPING, WE ARE EXCITED TO HAVE HER HOME!